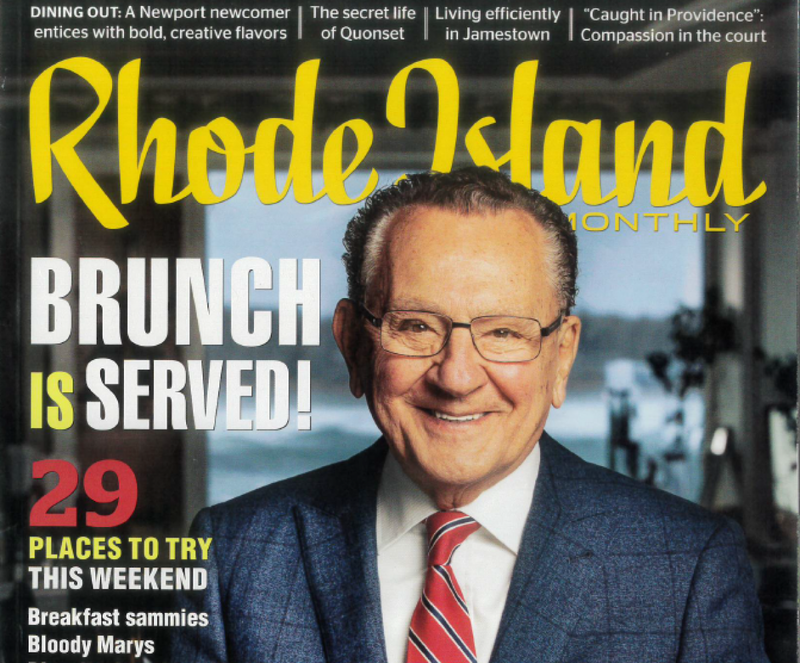 We are pleased to announce that a recent project completed by Atlantic has been featured in February's issue of the Rhode Island Monthly Magazine! Imagine sitting on the deck of a modern, New England style house admiring the sweeping views of Mackerel Cove in Jamestown, RI while below you butterflies and honeybees flutter throughout fields of native plants and wildflowers. Beginning in April 2017, Atlantic Lawn & Garden had the pleasure of pioneering the transformation of a piece of property on Beavertail Peninsula into an environmentally conscientious landscape. Any traces of a grassy lawn have been removed. The driveway has since been altered with permeable pavers to control water runoff- Clover and Fescue grass seeds were planted within the stones to provide hardy, drought tolerant greenery and mitigate soil loss. In addition to the permeable driveway, a Rainwater Harvesting System was installed with underground tanks, as well as various precipitation gardens throughout the property to alleviate similar issues. 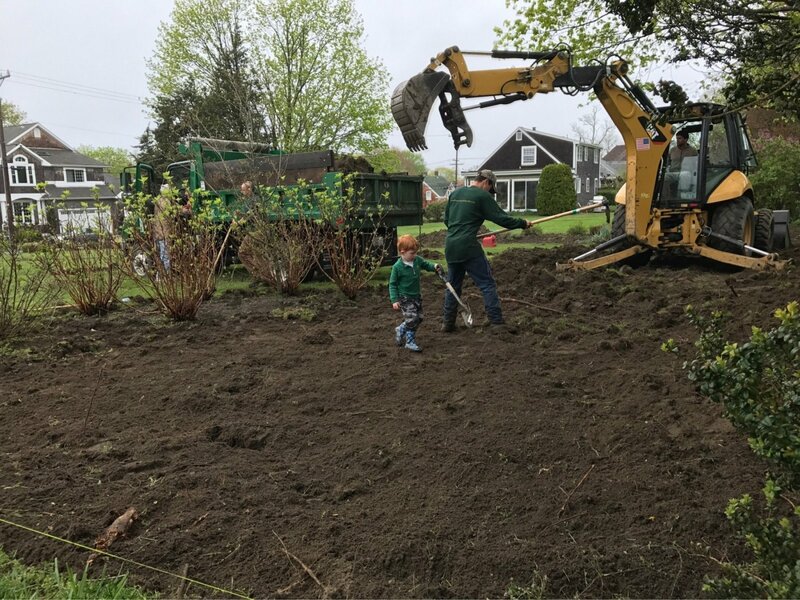 A large, raised vegetable garden bed was installed, as well as various native perennials to encourage the local plant species against invasives, such as Burning Bush and Japanese Rose. Among the perennials, several wildflower spaces were created from seed. Such spaces help in attracting and supporting pollinators such as honeybees and butterflies. The bountiful spread of flowers includes Firework Goldenrods, Lavender Hyssop, Wild Blue Indigo, Butterfly Milkweed, Red Bergamot among many others fill the landscape with summer scents and a sight to behold. This season we turned a quarter acre of unused lawn into a permaculture style garden. A layout was created using a key-hole design style. This key-hole style maximizes the planting area while providing easy access to vegetables and creating different rooms within the garden. The existing lawn was stripped and lots of compost was amended to the soil. The compost provides nutrients to the plants, helps hold moisture and creates a much stronger soil composition. Plants were planted over the course of a few weeks. Many of the vegetables were grown from seeds and started indoors. Fruit trees were added to create shelter for plants that like a little shade. Most of the plants we chose were perennial species, which minimizes the future spring planting work. Some of the perennial plants we included were Apple, Pear, Persimmon, Cherry, Fig, Plum, Blueberry, Raspberry, Grape, Rosemary, Horseradish, Strawberry, Hops, Thyme, Sage and more. We also planted plenty of common annual vegetables, including Tomato, Pepper, Sunflower, Onion, Beet, Carrot, Basil, Parsley and many others. Other plants were included to provide shelter, wind blocks, bird and beneficial insect attractants, and aesthetic value. A deer fence was installed using cedar posts we gathered from our job sites. The cedar was also used to create a grape arbor and the gates. The garden produced a lot of food within its first season. We are looking forward to much more as plants get more established. 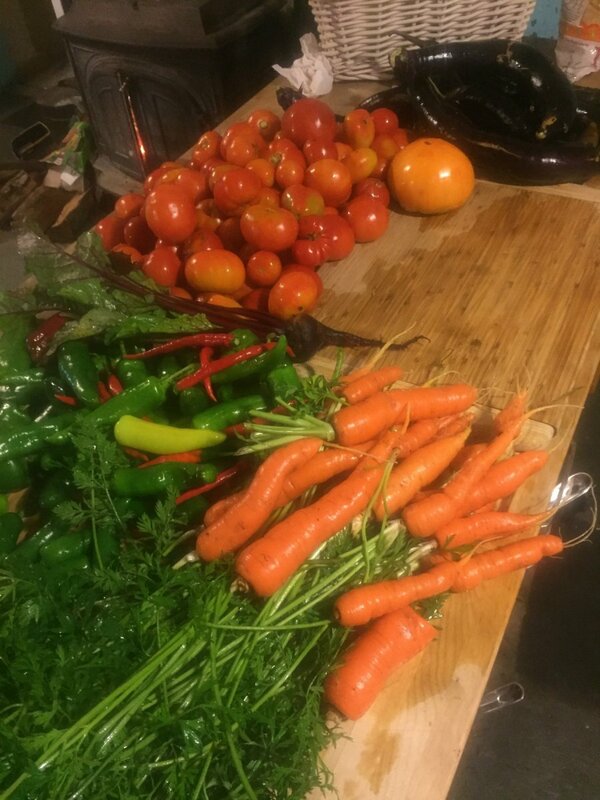 Next season we plan to add more of your common vegetables, especially Heirloom Tomatoes. We plan on incorporating bees and chickens in the upcoming years. Birds can be very beneficial to a garden in terms of insect control and fertilizer. We did not use any synthetic fertilizer or chemical pest control products. We used wood chips to mulch the garden areas which helped conserve moisture and keep the weeds in control. We hope to use this garden as a test bed and example of what other people can do with their back yards. Call Atlantic today to see how we can design, install and maintain a permaculture garden in your yard. Atlantic is proud to be presented the Best of Newport County Award. 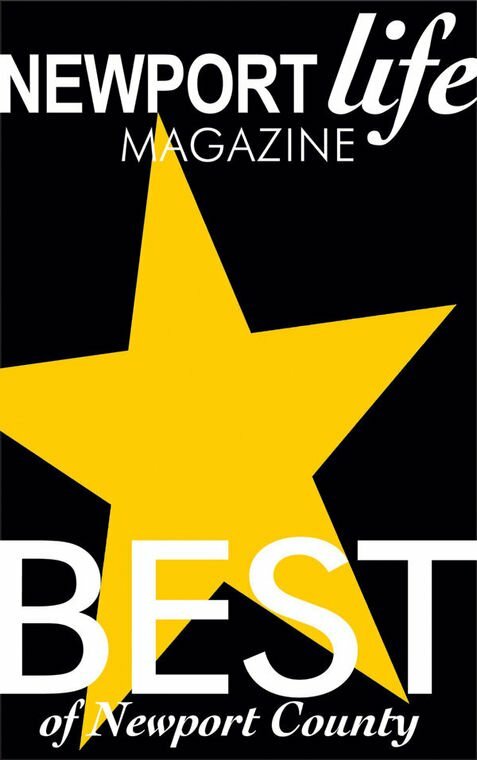 Each year, Newport Life Magazine recognizes local organizations and businesses that have been voted the BEST by its readers. We are happy to see our list of clients expanding on Aquidneck Island. Thanks to everyone who voted for us. As your shade trees begin to leaf out, be on the look out for caterpillars. They have the ability of being a major nuisance to your property, as well permanently damaging your beloved shade trees. The trees to keep an eye on our the Maples, Cherries, fruit trees and blueberry bushes. The Winter Moth emerge in late November and mate and the females lay eggs primarily on the trunk and large branches of trees. The eggs are very hard to identify, they are very small orange specs which can be seen in the bark. If identified there is a treatment for the eggs. A horticultural oil can be sprayed on the trees in late winter, but temperatures need to be above 45 degrees for dormant oil to be effective. Fruit trees and berry shrubs should be sprayed early with oil to prevent damage to flower buds. If flower buds are damaged, the fruit crop will be lost. 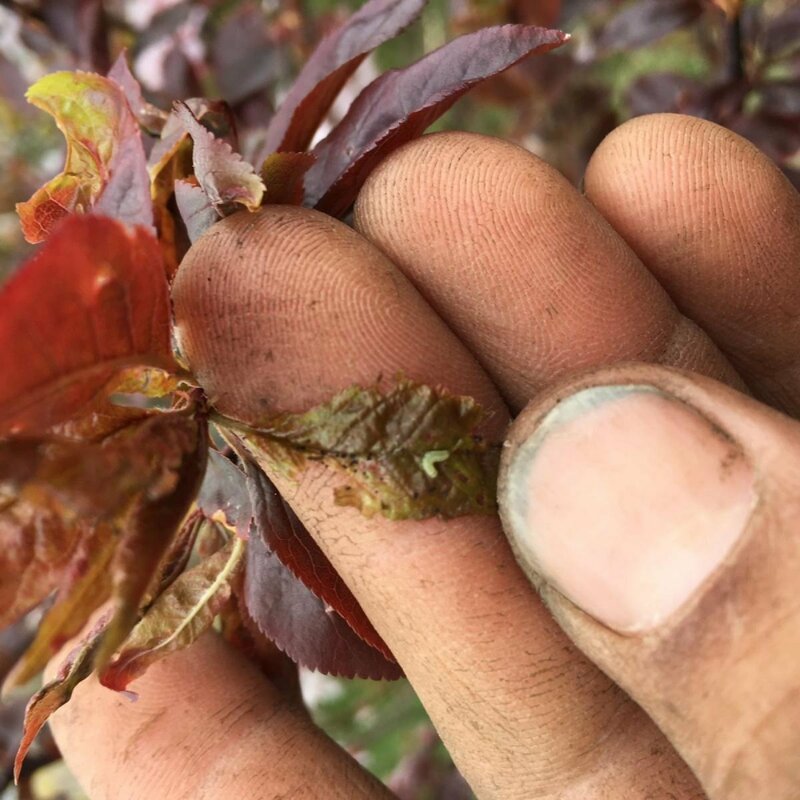 If damage is identified as tree is leafing out, it is crucial to treat promptly. Starting in late April the tiny green caterpillars may appear, they will burrow into the bud scales. This is when injury to your tree will occur. 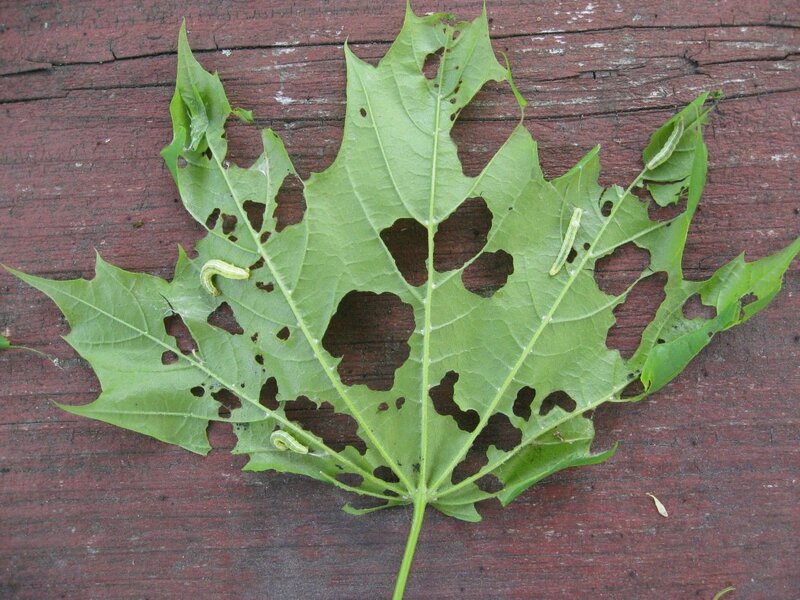 Your leaves will be riddled with holes and even look defoliated as the season progresses. If you identify any of these symptoms it is important to spray immediately. Bacilus thuringiensis, commonly known as B.T, it is ingested by the caterpillar. It works best on the younger states of caterpillars, so spray promptly! Once B.T is ingested the caterpillars will stop feeding immediately. Caterpillars will also excrete black sticky substance that will make a mess of your walkways, house and cars, And ruin the trees which add great value to your property. It is important to identify the pest, so it can be treated before it is too late! After damage is present, watering becomes very important to help sustain new growth thats likely to emerge. Caterpillars will fall from leaves later into the spring season. Spraying at this time becomes a wasted effort. Call Atlantic for a free tree evaluation. There are a few key factors to developing a pesticide free, natural lawn and landscape. We look at your whole yard and current use of the lawn to come up with low maintenance, natural solutions. Sometimes the best approach is to consider lawn alternatives in those hard to grow locations. Sunny areas can host wonderful meadows while shady spots make great woodlands. To create a healthy pesticide free lawn we recommend a generous amount of good topsoil. Our topsoil is mixed with compost to increase it's water holding capacity, nutrient and microbe counts. A strong lawn requires a minimum of 6 inches of topsoil, the more the better. We fertilize our lawns spring and fall with an organic lawn fertilizer which also helps feed the soil. Unlike synthetic fertilizers, the organic approach lasts much longer, requiring fewer applications. Organic fertilizers improve soil quality adding a wide range of nutrients. They have lower dosages of nitrogen with less risk of burning your lawn. Soil tests are available for understanding a soils PH and nutrient deficiencies. 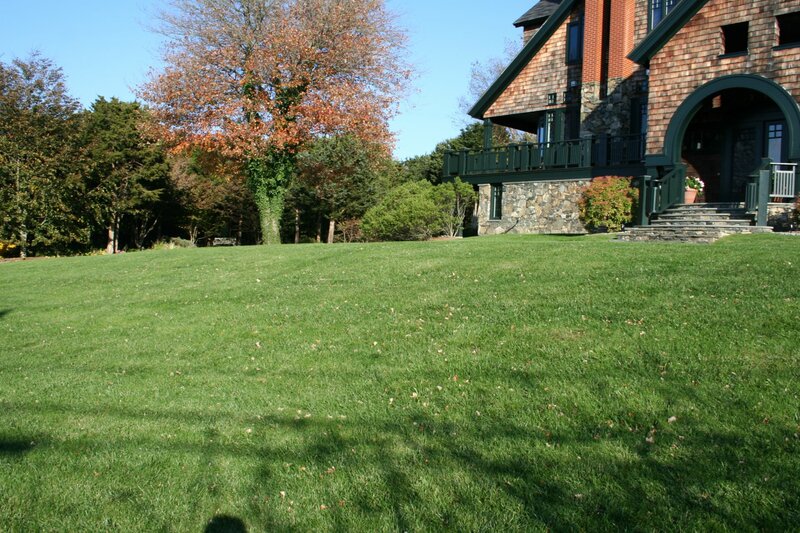 We aerate and slice seed many of our properties to improve the thickness of the lawn. Watering is essential for new seedlings to establish. (we provide a watering service for new lawn and plant installations) Proper mowing practices, cutting at a higher height, helps choke out many weeds. A thick healthy lawn is the best defense against weeds. For other lawn pests like grubs, we recommend monitoring on an annual basis and treating the lawn when necessary. Adding a tree to your yard can create shade and eliminate sun loving crab-grass. Call us today for a free lawn and landscape consultation. We provide lawn care service in Jamestown, North Kingstown, Narragansett, East Greenwich, Warwick, Newport, Middletown and Porstmouth. Welcome to the new Atlantic website! It's been 3 years since we last updated the look of our website and there have been some big changes. Our portfolio now showcases the wide variety of services that we provide and is a great way to get inspiration for an upcoming project, just click the relevant tag or use our smart search. Our goal is to keep the website up-to-date with all the latest news, career opportunities and offers direct from the office and look out for exciting new customer features coming this winter. We hope you enjoy the changes and we would love to hear your feedback so we can continue to improve the site. You can do that as well as contacting us about any other queries using the Contact Form. 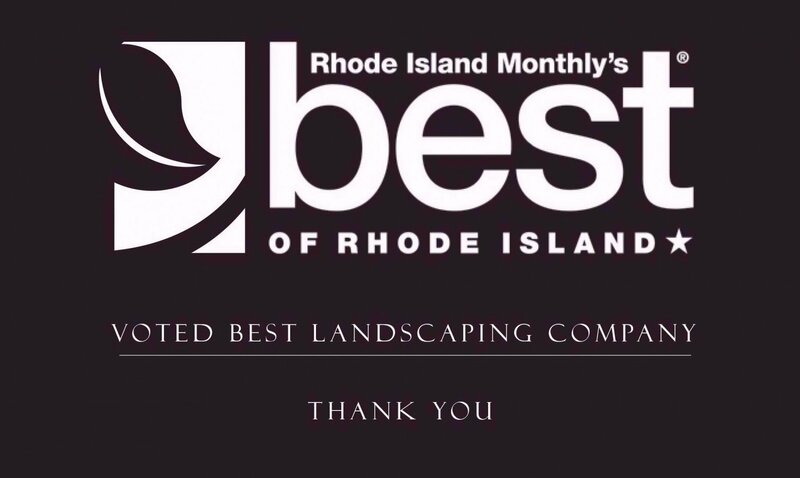 We are excited to see Atlantic was awarded Best Landscaping Company by Rhode Island Monthly this year. They chose us for the wide range of landscape services we offer. If you're an existing ALG customer you can view your stored information as well as contracts, scheduled work and invoices online and all in one place. Contact us now for more information on how to receive your login information.